Download Stronger in Digital HD from the iTunes store. Stronger images are © Lionsgate. All Rights Reserved. In April of 2013, the landscape of Boston and the marathon were changed forever. A simple act of terrorism rocked the city and the Boston Athletic Association to its very core and kept the world waiting with bated breath as the drama unfolded. On that day at 2:49 pm, two homemade bombs exploded near the finish line of the race killing three people, including an 8-year-old boy, and injuring several hundred others, 16 of whom lost limbs. One of the latter individuals is Jeff Bauman who lost both legs above the knee. 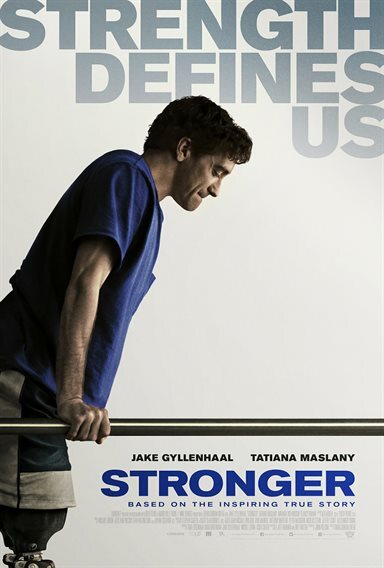 The movie Stronger, starring Jake Gyllenhaal (Brokeback Mountain), chronicles Jeff's story from why he was there that day to where he is now – almost 5 years later. Jeff was a Costco worker who loved his Boston sports teams and was in an on again/off again relationship with Erin Hurley (Tatiana Maslany; Orphan Black). Currently on a break (again), Jeff decided to do what he could to win Erin back so when she ran the Boston Marathon in 2013 Jeff decided he would be there cheering her on. With sign in hand, he made his way to the finish line awaiting her to pass by when suddenly his life was changed forever by a bomb. While Jeff survived, he was critically injured and had to have both legs amputated above the knee. He suddenly became one of the famous ones, especially since he actually saw one of the bombers a minute before the explosion and gave a description to the FBI. He was suddenly a hero to an entire city (and the whole country as well) while internally he was simply struggling to live his new life in a wheelchair or on prosthetics. While the circumstances managed to bring Erin and Jeff closer for a while he pushed her away especially after learning she was pregnant with their child. However, after a period of time and after losing Erin once again, Jeff grew up and dedicated himself to his recovery and to walking again. This may be some of Gyllenhaal's best work to date as we see Jeff's struggle written all over his face while he tries to pretend everything is simply ok. Gyllenhaal also manages to pull off the role as a double amputee admirably. Maslany is terrific as Erin, expressing her initial sense of guilt followed by her frustration with Jeff's apathy. Miranda Richardson (The Hours) as Jeff's mom, Patty, dons a pretty convincing Boston accent while she portrays a woman living through every parent's nightmare wanting to help her son while actually really enabling his helplessness. The Blu-ray is presented in 1080p video with a 2.39:1 aspect ratio. The colors are well represented and the quality is sharp and clean. The 5.1 DTS-HD master audio is crisp with the dialogue relegated to the center channel and the effects heard through the sides for a fully immersive experience. Besides the Digital Download, the Blu-ray only comes with one 30 minute extra called Faith, Hope and Love: Becoming Stronger. This featurette gives the audience an in-depth look behind the scenes as well as into the mind of Jeff Bauman himself. Based on real-life events, the film is inspirational and heart wrenching as we sit as voyeurs peeking into Jeff and Erin's life. 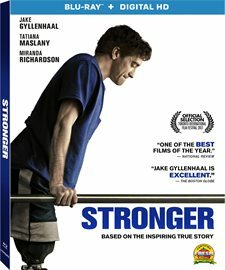 Well-acted with terrific direction, Stronger is a wonderful film chronicling one man's struggle for identity as a city looks to him as a hero and a symbol of strength and resilience. This isn't a movie about the events of April 2013 and how it affected Boston and the United States. Rather, it is about how one sunny afternoon affected a simple man, his girlfriend, and his family.